Professor Mark Aldenderfer and his colleagues study high-elevation populations to better understand adaptation. The genomes of ancient Andean settlers reveal a complex picture of human adaptation, including when they became able to digest starches and how evolutionary modifications allowed them to live at such high altitudes. A new paper co-authored by UC Merced Professor Mark Aldenderfer illuminates the changes that took place between initial settlement and the 16th-century colonial period. Aldenderfer, chair of the Department of Anthropology and Heritage Studies , worked with a team led by a University of Chicago researcher using newly available samples of ancient DNA. They studied how ancient Andean people — including settlers around Lake Titicaca in Peru and Bolivia, 12,000 feet above sea level — adapted to their environment over the centuries. “The Genetic Prehistory of the Andean Highlands 7,000 Years BP Through European Contact,” published today in the journal Science Advances, compares the team’s seven ancient genomes to 64 modern-day genomes from a highland Andean population, the agropastoral Aymara of Bolivia, and the lowland hunter-gatherer Huilliche-Pehuenche in coastal Chile. The goal was to identify adaptations that took place from the early migration into the Andean highlands, about 7,000 years ago, through the arrival of the Spanish in the 1530s. The team used ancient samples from the high Andes because those early settlers have the closest affinity to the people who now live in that area, the researchers said. They live in a harsh, cold, resource-poor environment, with low oxygen levels, but people there adapted to the climate and the agrarian lifestyle. Aldenderfer is an anthropologist and a distinguished professor with the School of Social Sciences, Humanities and Arts , and holds the endowed John D. and Catherine T. MacArthur Chair. Some of his previous work with colleagues uncovered the earliest evidence of potato consumption among the Andean highlanders. 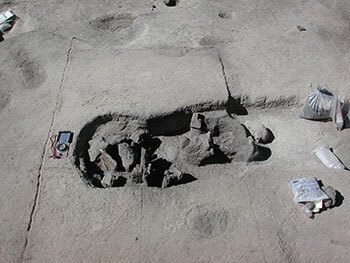 One of the ancient burial sites the team studied. The strongest genetic signal found is a gene called MGAM (maltase-glucoamylase), an intestinal enzyme important to digestion of starchy foods such as potatoes — a food native to the Andes. A recent study suggests the requisites for enhanced starch digestion began there at least 7,000 years ago. Also, even though the highlanders live above 8,000 feet with reduced oxygen, frequent frigid temperatures and intense ultra-violet radiation, they never developed the responses to hypoxia seen in natives of other high-altitude settings, such as Tibet. The Andeans might have adapted to high-altitude hypoxia via cardiovascular modifications, the researchers suggest. They found evidence of alterations in the DST gene, associated with the formation of cardiac muscle. Andean highlanders tend to have enlarged right ventricles, which might improve oxygen intake by enhancing blood flow to the lungs. This enlargement is known, in other places, to increase the risk of pulmonary hypertension, a type of high blood pressure. Research also indicates the highland Andeans experienced much smaller-than-expected population declines after coming into contact with Europeans in the 1530s. The harsh mountain environment might have discouraged European invaders, which could have protected the highlanders from frequent exposure to lethal foreign diseases, such as smallpox. More than 90 percent of lowlands residents died from diseases they had never been exposed to before. But peoples in the Andean highlands experienced only a 27 percent population reduction. The ancient genomes also revealed early selection for immune-related genes soon after the arrival of Europeans, suggesting that Andeans who survived slowly gained the ability to respond to the newly introduced European pathogens. By focusing on the period before European contact, the researchers could distinguish environmental adaptations from adaptations that stemmed from historical events. The National Institutes of Health, the National Science Foundation, the American Philosophical Society, the National Geographic Society, the H. John Heinz III Charitable Trust, the University of Chicago Provost’s Postdoctoral Scholarship and the Chilean National Council of Science and Technology funded the study. Research partner institutions include UC Davis, Emory University, the University of Chile, University of Oklahoma, University of Arizona, the Peruvian Register of Professional Archaeologists, Case Western University and the Max Planck Institute, Germany.